My son enjoyed making a LEGO Olympics scene. It came out great! 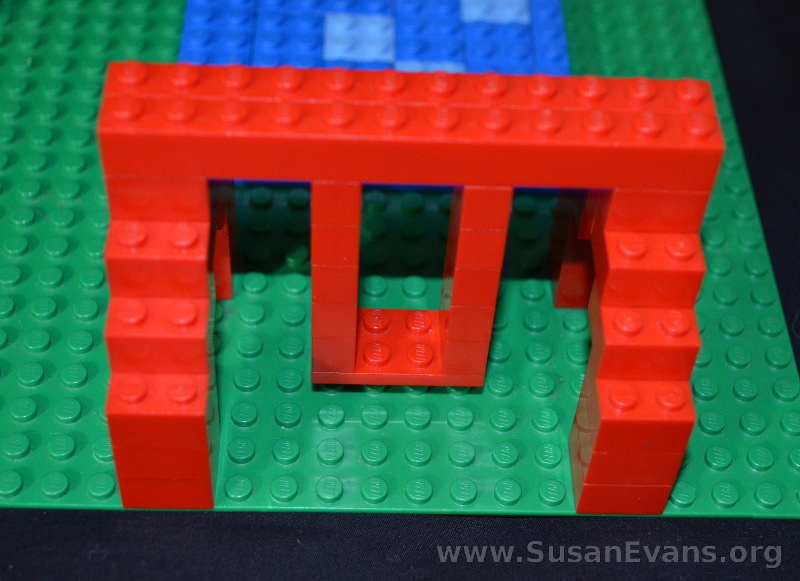 He started off with a green LEGO base, attaching a red track around the base in the form of a circle. This was the running track, and he placed several Olympic runners on the race track, bending their legs and arms as if they were running. Next he made a long jump activity. He made this out of green LEGOs, alternating light green and dark green. He placed several jumpers on it. One jumper had his hands back and was tilted slightly forward because he was about to jump. The other jumper had already landed and was in a sitting position. The next part is the swimming area. Several swimmers are in the water; one is going one direction and one is going the other. If you want to make a larger Olympic swimming pool, you can make another scene. 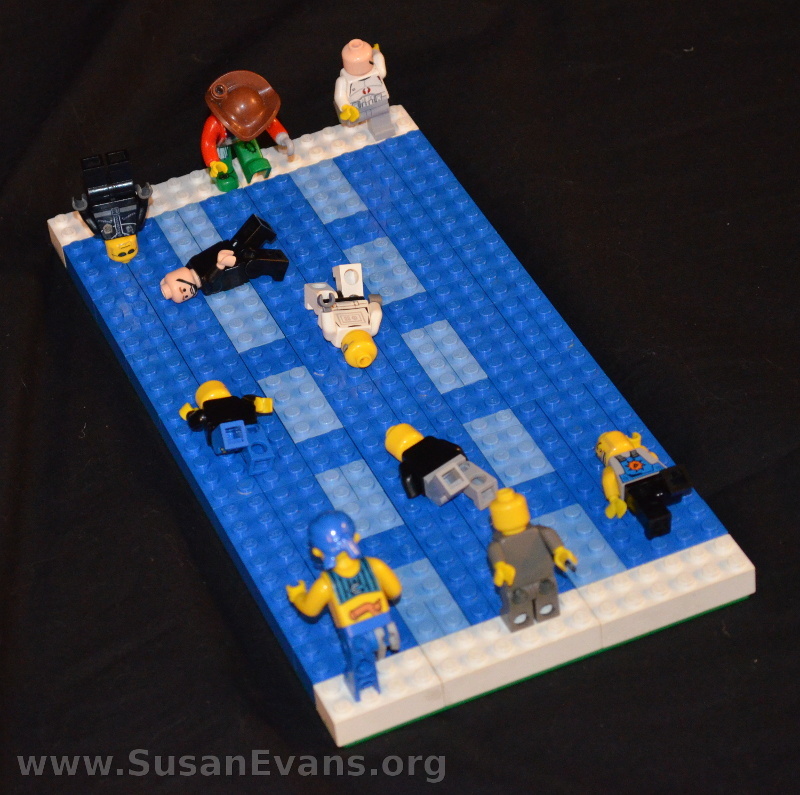 This way you can make lanes in the swimming pool by using light blue LEGOs as the dotted lines inside the dark blue swimming pool water. Place white LEGOs on the two shorter edges of the swimming pool, and have the swimmers diving into the pool and swimming down the lanes. 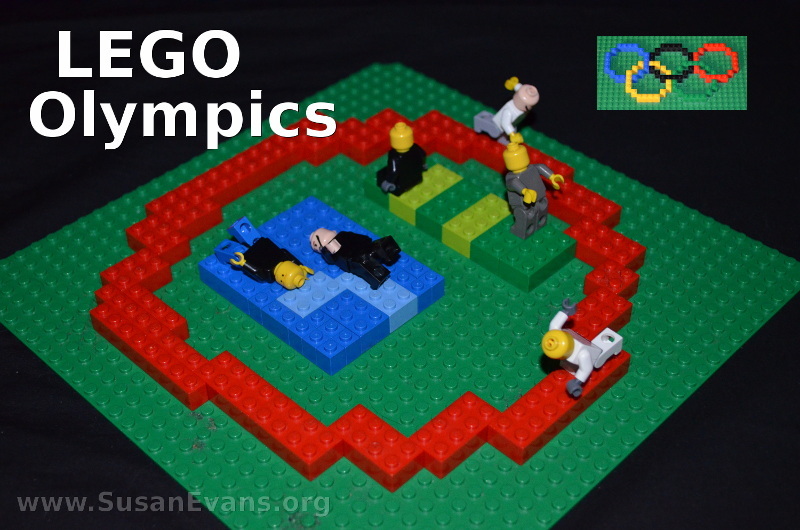 I hope you enjoyed our fun Olympic LEGO scenes! One of my sons made a LEGO playground. It turned out really cool! He made a water slide, a swing set, a picnic table, and a merry-go-round. He started with a green LEGO base, and he built a water slide. 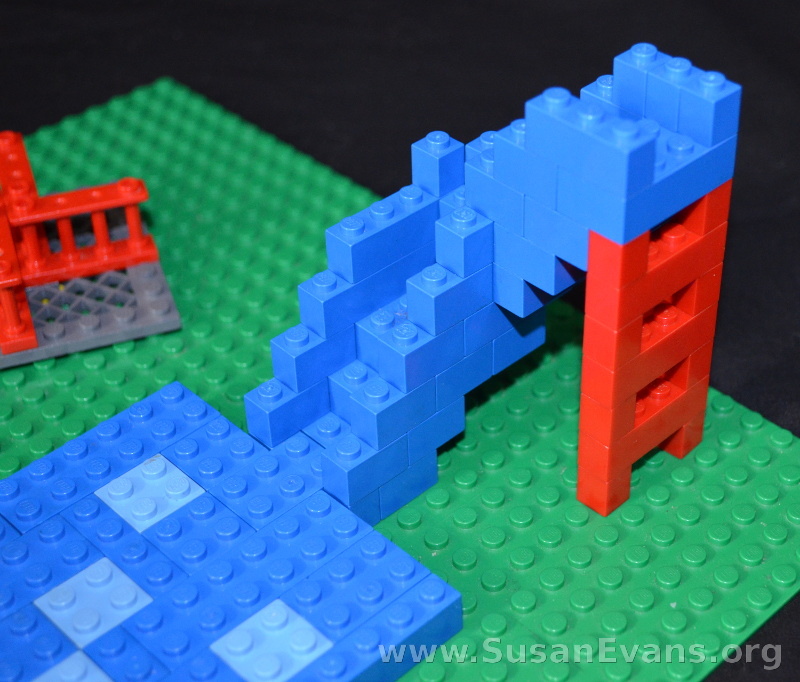 He made a ladder out of red LEGOs, and the sliding part was made out of blue LEGOs that looked like steps that curled around. The swimming pool was made out of two different shades of blue. Next my son made a swing set. He made this out of red LEGOs. The swing itself was a “U” shape, and it was stuck to the top bar. 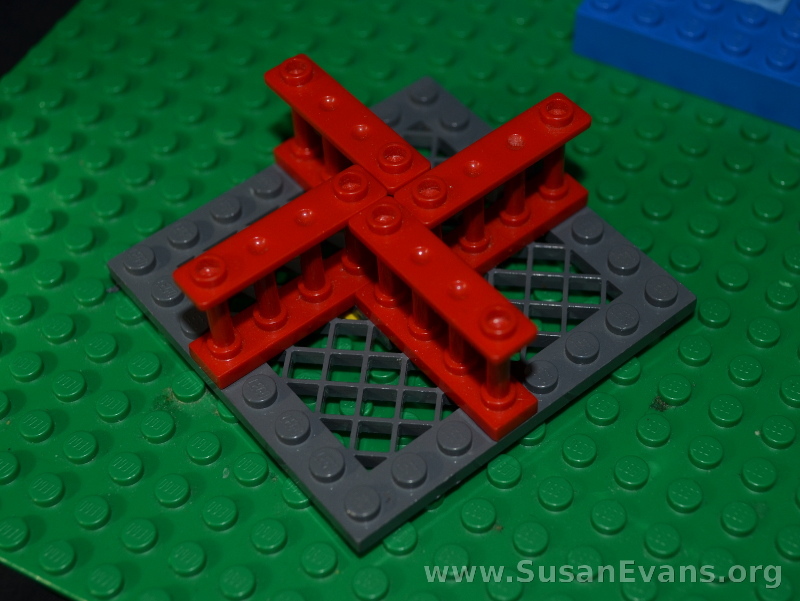 There were four LEGO legs to the swing set in an upside-down “V” shape. Next he built a merry-go-round. He placed a spinner LEGO on the bottom so that he could spin it around freely. The gray piece was on the bottom, and four fence pieces made up the rails. 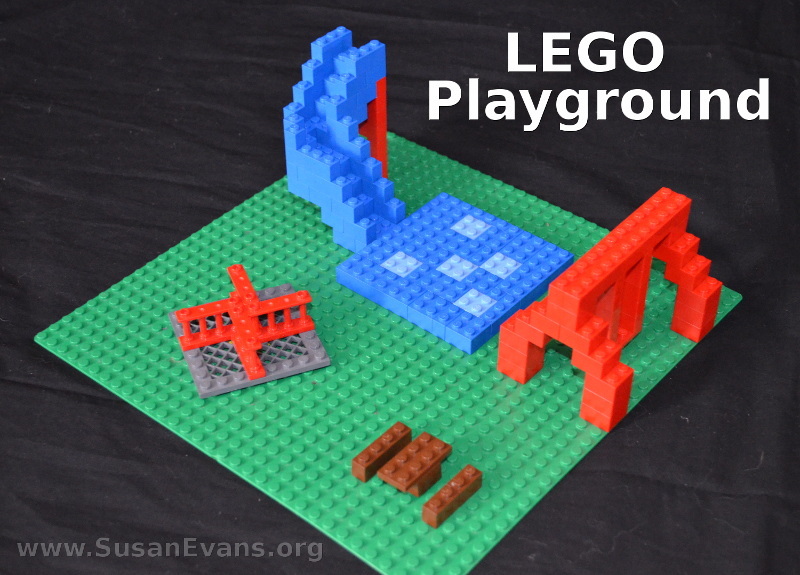 You can also make a picnic bench out of brown LEGOs. Now you can enjoy your LEGO playground! Upward Basketball is a Christian-based sports program that has games once a week for 8 weeks during January and February. 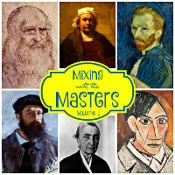 Many homeschoolers participate for their homeschool P.E. program. The boys meet once a week for practice, and the volunteer coaches pray and give the kids cards with Scripture to memorize during the week. The basketball drills include dribbling, passing, shooting, layups, blocking, and teamwork skills. Two of my sons were on the same team, even though they are two years apart in age. I saw my sons’ skills improving over the two months, and they even scored a few baskets. My boys have enjoyed playing Upward Basketball for two years now. 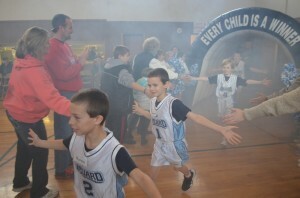 At the beginning of each game, the boys run through an inflated archway with a smoke machine creating a special effect. Parents and siblings line up on both sides of the archway , creating a human path through which the boys run, slapping the hands of everyone as they run through. The introduction to “The Final Countdown” blasts over the speakers as they run through. The boys are given colored wristbands that match one player on the opposite team. This way the boy doesn’t forget who he is blocking. At the beginning of the season, watching the game is like watching an episode of “The Three Stooges.” It’s comedic really. By the end of the 8 weeks, actual basketball is being played, since the boys know what they are doing by then. 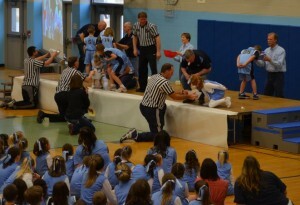 The basketball season culminates in an award ceremony which meets at the local school gym. Minute-to-Win-It-style games are played. One of the games had the participants shaking ping-pong balls out of a kleenex box tied around their waist. Whoever emptied their ping-pongs first won. (One of the coaches was much faster than any of the kids, so he won the challenge.) Another game had the participants put Vaseline on their noses. They dipped their noses into a basket of cotton. The cotton stuck to their noses, and they ran across the stage to shake off the cotton into another basket. There were three teams, and our team won. We had the most cotton balls in our basket after a minute. 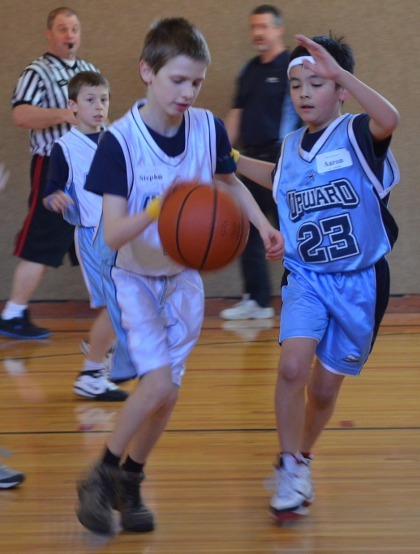 Overall, Upward Basketball is a great way to get your homeschooled kids involved in a sport with a minimum time commitment. It’s hard for homeschoolers to pull together a team and find coaches, but here you have everything taken care of for you, by a nonprofit Christian organization. My kids have enjoyed it. Several years ago my husband and I were praying about what to do with one of our sons who was uncoordinated. Three of my children learned physical skills easily while the other child took forever to learn them. Learning how to ride a bike took just a few days of practice for most of my kids, but months of practice for this one son. We put him into soccer, and that was disastrous. Nobody would ever kick the ball to him, so how was he supposed to improve? He was so frustrated; you could see the frustration all over his face. So we pulled him out of soccer after one season, even though his brothers have continued to do various team sports and have loved every minute of it. I advise homeschool parents to pray about the weaknesses of their children. God knows the exact answer to your prayer. You might not come up with it yourself unless you ask God. For our family, the answer was a Christian karate place nearby. The students quote Scripture as they do their poses. Both my husband and I felt a supernatural peace about signing up our son. A year later, I had a son who was physically fit and had control over his body movements. It was a miracle. We are now in his third year. A homeschool mom recently walked up to my son and asked him if he liked karate. I tried to change the subject. My son had never thought to question whether he was supposed to go to karate or not. He hadn’t thought of being rebellious to fight what his parents knew was the right thing for him. 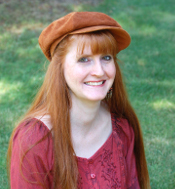 The homeschool mom didn’t realize that children don’t rule. Any activity that you sign your kids up for that is making up for a weakness will not be the favorite activity of your children. That’s because that activity comes hard for them. But if it’s what God wants you to be doing, it will strengthen those very weaknesses so that for the rest of that child’s life, he will not struggle in that area as much. And if you’ve prayed about it and have a supernatural peace and joy in your soul about that activity and are in complete agreement with your husband, move forward and do it. Your child will come to expect that it’s a part of his life.